As you can see, the fun has begun! You can check out 2014, 2015 and 2016's lists also. Those strawberries look so good! And horse back riding camp, how fun! That is such a great list!!! You are going to have a lot of fun! LOVE your list. We haven't even glanced at ours...ooooppppssss. I guess we should do that today. 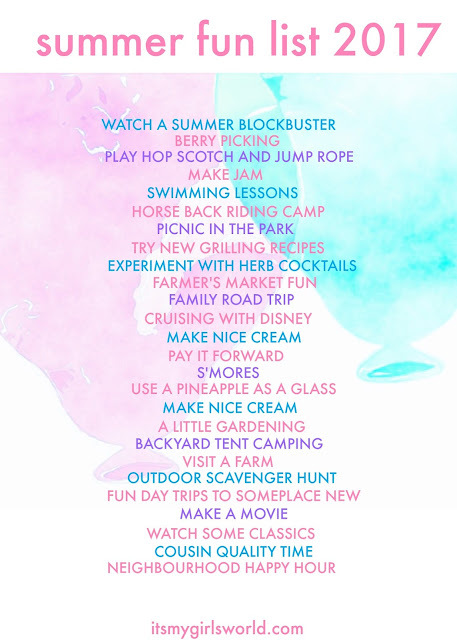 I need to make a summer fun list! Definitely overdue for some s'mores! Looks like a fun list which I can't wait to read more about! So many fun things lined up to make a perfect summer break for the girls! Those strawberries look amazing!! I'm sure you all will have a blast on the Disney Cruise since there's entertainment for all ages. Enjoy! Backyard Tent Camping is top of my list! Oh my goodness, can I tag along on your guy's summer? Horseback riding, Disney cruise, and neighborhood happy hour?? Yes please! Looks like an epic summer in the making. Backyard tent camping all day! That's like the best idea I've heard all day.